Liquorice tea combines the flavours and health benefits of liquorice root with that of Chinese Black Tea, a true match made in heaven. Infused with natural liquorice oil, this beverage is strong-tasting and very characteristic in aroma. It has also been praised for lowering blood pressure, improving skin health, and providing relief from minor anxiety and depression. It is also known to provide excellent weight management and has the ability to boost the metabolism, which subsequently leads to your body burning fat quicker, and far more efficiently. However, for many, this Flavoured Black Tea is most enjoyable after a long, hard day. Its relaxing abilities, coupled with its sweet, delicious taste, ensure this brew will take pride and place inside your tea cabinet! Over the course of thousands of years, liquorice has served many purposes, including, of course, the flavouring of foods and beverages. It actually originates from the Glycyrrhiza glabra plant, and translated from Greek, means ‘Sweet Root’. In Ancient Egypt, King Tutankhamun was buried with vast quantities of Liquorice Root, clearly indicating its treasured status when found among his gold, jewelry, and artworks. It was likewise popular in the New World, with many Native American tribes consuming the Liquorice Root for health reasons. The Cheyenne favoured the consumption of Liquorice for gastrointestinal issues such as diarrhea. Meanwhile, the Dakota and Pawnee used it for tooth and ear aches, as well as for breaking fever. The Navaho were fond of liquorice for its use as a mild cathartic (laxative), and often infused it in boiling water to make a healthy decoction. Black Teas have been flavoured for hundreds of years almost as long as the brew has been in existence! Before then, Flavoured Green Tea was likewise popular, and would have likely been consumed not long after the tea plant’s discovery. Today, Black Tea is considered the most popular tea for infusing different flavours due to its ability to accommodate many strong, and often heavy flavours. Flavoured Green Tea, meanwhile, is usually created using delicate, subtle flavours, such as Aloe Vera. It is uncertain when Liquorice was first considered a delicious accompaniment to Black Tea. Yet, here at The Kent and Sussex Tea and Coffee Company, we are certainly glad that it was! 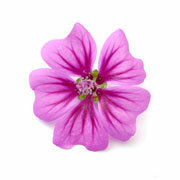 The addition of beautiful Mallow flowers enables this tea to look as good as it tastes! Type of Tea: Loose Leaf Black Tea, Natural Flavouring, Mallow Flowers. How to Serve: Honey may be considered for anyone with an especially refined sweet tooth. If you prefer a balanced brew, however, lemon may bring a scrumptious bitter quality. The Kent and Sussex Tea and Coffee Company believe it is best served as it is. Tasting Notes: For those who like liquorice, you will certainly not be disappointed! Strong and sweet in both flavour and aroma, this tea also consists of slight malty undertones, with a refreshing aftertaste. Benefits of Liquorice Tea: A collaborative study conducted in conjunction with the US University of Iowa and the Institute of Odontology at Göteborg University, Sweden, has recently uncovered Black Tea’s plaque fighting capabilities! Participants in the U.S. division of the study were given Black Tea to rinse their mouth with for 30 seconds, five times, waiting three minutes between each rinse. The reasoning for this was to simulate the effect of sipping tea. The Swedish division, meanwhile, saw test subjects rinse their mouth with Black Tea for one minute, 10 times a day. Both co-operating studies discovered that the more participants rinsed, the more their plaque and bacteria levels fell. The research indicated that the Polyphenolic compounds in all types of Black Tea - including Liquorice Tea - can kill or suppress cavity-causing bacteria from either growing or producing harmful acid. This, in turn, proves that Black Tea can help to improve oral health!